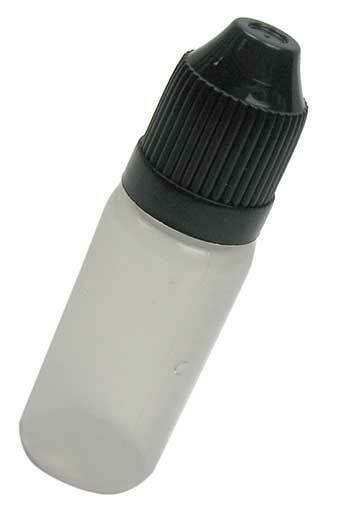 An opaque white squeezable bottle with a black plastic cap. The tops are screw-on for filling. This largish cistern holds 16 oz and is 2-1/2" dia x 8" tall overall. What you put into them is up to your own imaginations, but Nick, our Captain of Lens Cleaning, uses several to hold, you guessed it, optical cleaners of various strengths. 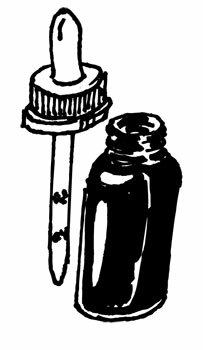 Eye dropper, tongue dropper, test tube dropper, petri dish dropper, anywhere dropper. 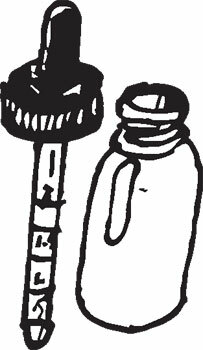 Use this 3" glass dropper, with a rubber squeeze bulb to drop small amounts of liquid wherever you think they should go. You will have to measure by counting drops, though, because there are no markings on it. Also, it is called "3" because that is about how long the glass tube is. Overall, it is 4" long. 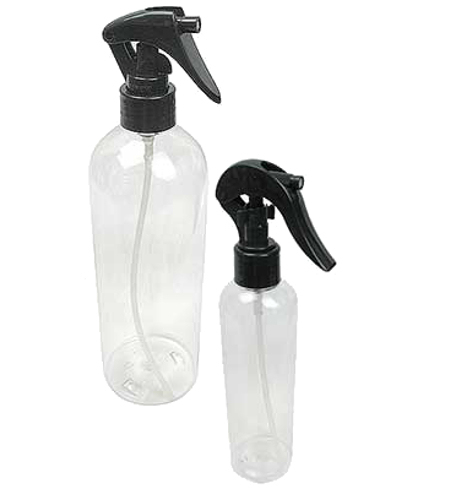 We’ve got a lovely bunch of clear plastic bottles with black plastic fine mist-sprayer caps. 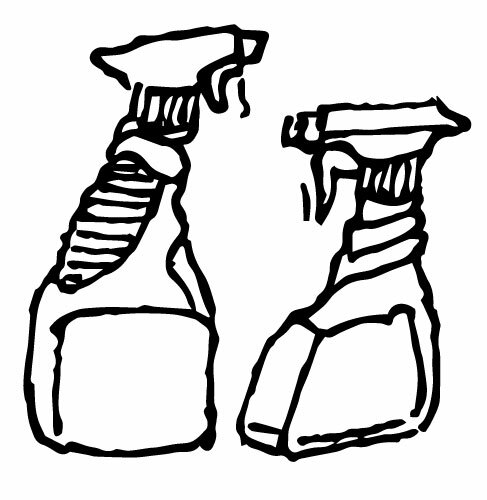 The triggers lock to prevent inadvertent misting tragedies. You pick the small, 4-oz, 6-3/4” tall x approx 1-1/2” dia; the medium 8-oz, at 8-3/4” tall x approx 2” dia; or the large 16-oz at 9-1/8” tall x approx 2-1/2” dia. 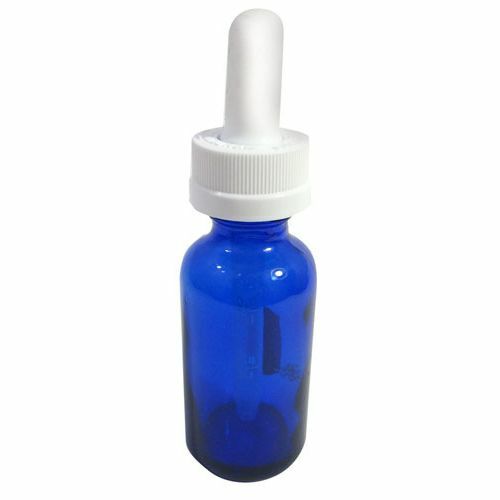 Squeeze out small drips, like eye drops, from these translucent white plastic dropper bottles, 2-1/4” tall x 13/16” dia with black plastic safety screw caps. Will hold approx 10ml, or 1/3 oz. 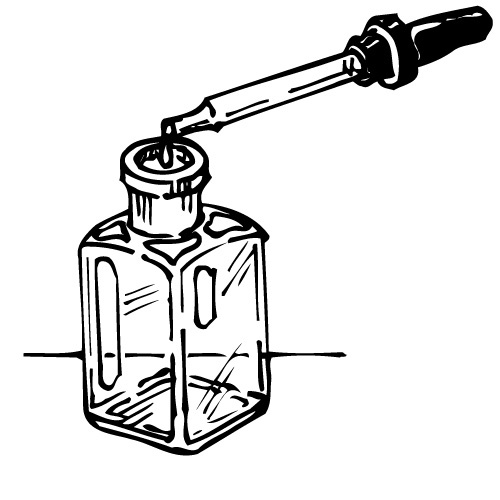 The dropper cap pops off for filling. Great for crafts--and arts, too. We’ve never had a bottle quite this one, in spring-like translucent-green coated glass. 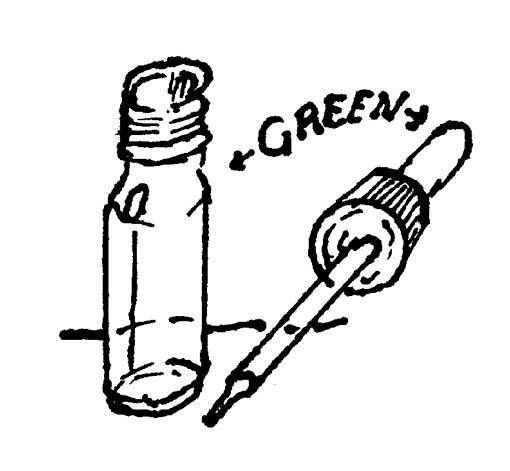 Plus it’s a dropper bottle, and the rubber bulb matches the pretty green color. Holds 10ml (1/3 oz), and measures 2-5/8” tall x 1” dia with a 7/16" ID mouth. 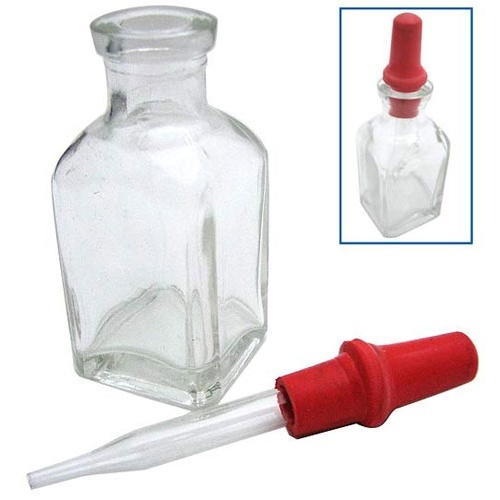 Has a black plastic cap, and the 2” long glass dropper has a 1/16” ID tip. This white plastic bottle has a fuchsia misting pump on top and is ideal for spraying your plants or keeping your face hydrated in the hot sun while watching polo matches or T-ball games. Holds 200ml (just under 7 ounces) and measures 7" tall x 2-1/2" wide x 1-1/2" thick in a truncated ovoid shape, not unlike most of us. 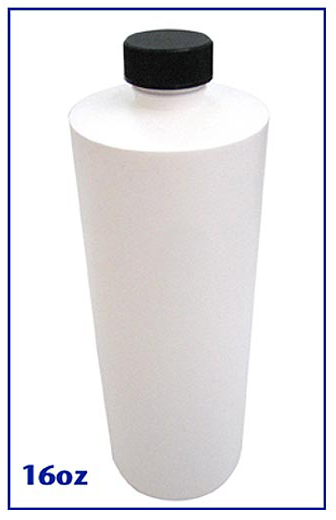 White plastic (PETE) bottles hold 120ml, just over (4) oz, and measure 4-1/4” tall x 1-13/16” dia. 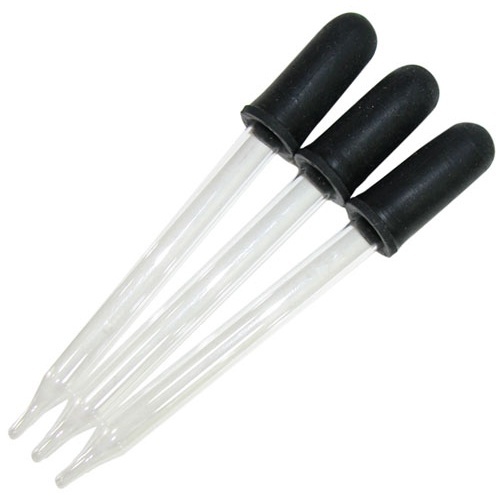 Come with a 3-3/4” long black dropper cap that holds approx 4ml, and is graduated up to 2ml in 0.5ml increments. No, not for replacing your cap, for replacing the cap you broke on your small spray pump bottle, or converting a small bottle to a spritzer. This one is white plastic with a 20-410 thread, gasket, 3-1/4" long feed tube and a clear plastic cover. 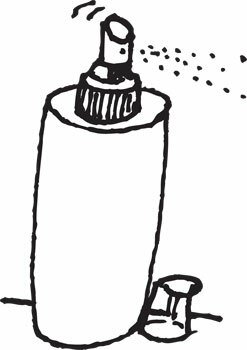 There’s no end to the things we all need to spray around the homestead--water at plants and cranky husbands being just two of them. 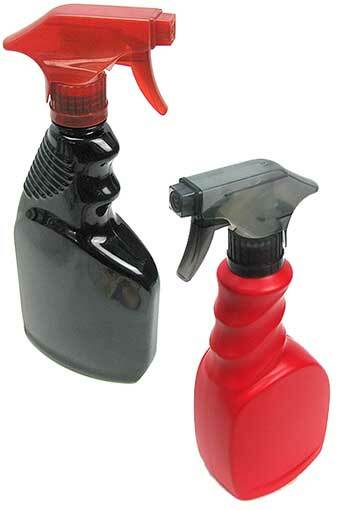 You need our plastic (PETE) pistol-grip spray bottles. 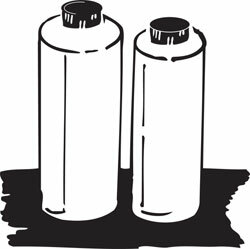 You pick: the black, 18-oz bottle, 8-5/8" x 4-1/8" x 1-7/8" with a red top; or the red, 20-oz bottle, 7-3/4" x 3-1/2" x 2-5/8" with a gray cap.